White small and narrow flowers, though abundantly produced and of a good clear white ; VII–X; mid-green foliage; height 21–25cm; spread 31–45cm. Not as good as 'Stoborough'. White flowers; VII–X; mid-green foliage; erect; height 21–25cm; spread 31–45cm. 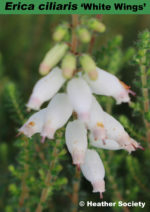 The best white Dorset heath, found near Stoborough, Dorset. Flowers white; VIII–IX; dark grey-green foliage; spreading; height 10–15cm; spread 31–45cm. Sport from 'Mrs C. H. Gill' found at Foxhollow, Windlesham, Surrey.